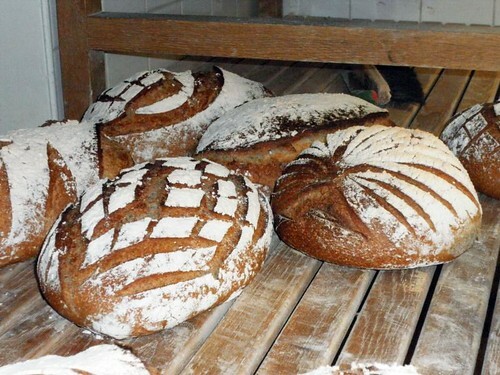 Today, I want to link to a text written by Sébastien Boudet, a French baker in Sweden who's putting a lot of hard work into reforming the way we think about bread. This text was refused by a Swedish bread magazine (BAKA), because they didn't want the debate. Pretty sad! So, instead, head over to Sébastien's blog and read it there. Swedish only, I'm afraid. It's about the bread industry, and all the shortcuts that are going on. The flour is so inferior it needs additives to behave properly, and a lot of bakers don't learn the proper craftmanship that baking really is, since they use shortcuts and "cheats". (Among these ascorbic acid, sourdough powder, and yeast, too.) I might not agree with every word he says, but he sure is passionate about his beliefs, and his knowledge is immense. I've written about Sébastien before, when I had an opportunity to take a two-day baking class with him. Great experience! It's sad to see the short cuts food manufacturers are using in so many Western countries. We like to think we can trust them to look after our health,when in fact as more research is being done, it's being proven that many of these highly processed food are the cause of a number of cancers and heart diseases. We face the same problems in my country ( New Zealand) as you do.